Superman has triumphed in a poll to find the most popular fictional superhero of all time. 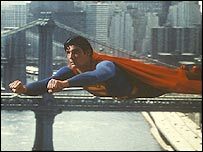 The comic book star, most memorably played by the late Christopher Reeve, was chosen by visitors to UCI cinemas ahead of Spider-Man and Batman. "Superheroes have often been favourite characters in the movies," said a UCI spokeswoman. "Superman is the original and best Man of Steel, a character close to the hearts of kids young and old." She added: "Christopher Reeve - who himself became a hero to many with his remarkable courage and spirit - reminds us just how much we enjoyed the character he played." The poll of 4,985 cinemagoers was conducted to mark the release of the Disney-Pixar animated film The Incredibles, which sees a family of superheroes try to cope as regular people in suburbia. But the central character Mr Incredible proved no match for the established crimefighters, coming only fifth in the vote behind The Hulk. Others who made it into the top 10 included Daredevil, Wolverine of the X-Men and the Ninja Turtles. A planned new big screen version of Superman has been beset by problems with several directors walking out on the project. But X-Men director Bryan Singer is now in charge of shooting the movie and has cast relatively unknown actor Brandon Routh in the lead role.